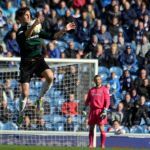 Raith Rovers failed to reproduce a result or performance similar to the one they achieved on their last visit to Ibrox, losing heavily to Stuart McCall’s side in a 4-0 defeat. There were two changes to the starting eleven from the team which began the midweek loss to Cowdenbeath. The 3-5-2 formation from that match was dispensed with, meaning Dougie Hill dropped to the bench, while Ross Callachan also missed out. Kevin Moon stepped into the middle of the park to play alongside Martin Scott, while Grant Anderson started on the right-wing. 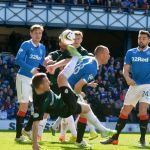 There was a rather subdued atmosphere around Ibrox as the match began, and that seemed to transfer onto the park, with Rangers controlling possession in the opening exchanges, without really making too much in the way of chances, other than a Lee Wallace cross, which ended up on the roof of Kevin Cuthbert’s net. 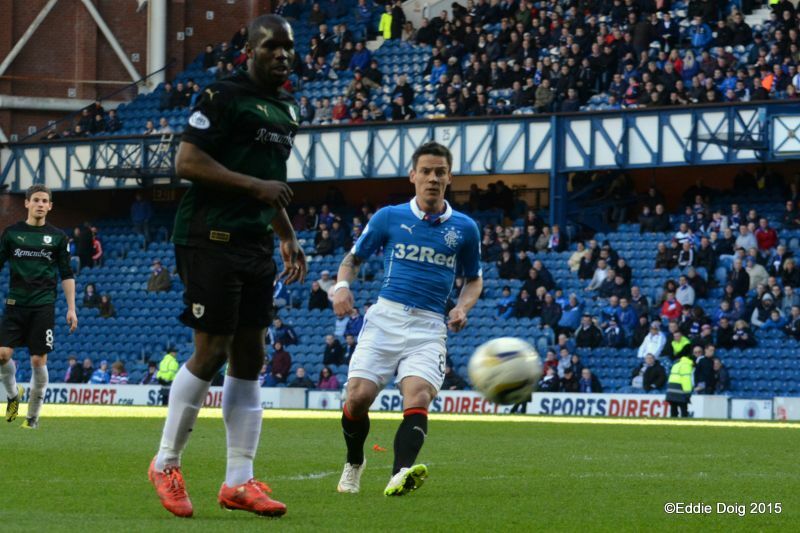 Out of nothing however, Rangers took the lead in the fifth minute. An innocuous looking cross into the box should probably have been cleared fairly easily, but with two Rovers players in a position to clear their lines, Ryan Conroy’s header appeared miscued, as it spun behind the corner. From the resultant set-piece, Nicky Law swung in a cross from the right-hand-side, to find Nicky Law in space, and his firm header ended up in the back of the net. 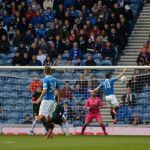 It was the worst possible start to the match for Raith, and was reminiscent of how they began the last league fixture at Ibrox, when Lee McCulloch nodded Rangers ahead in the opening ten minutes from a corner. 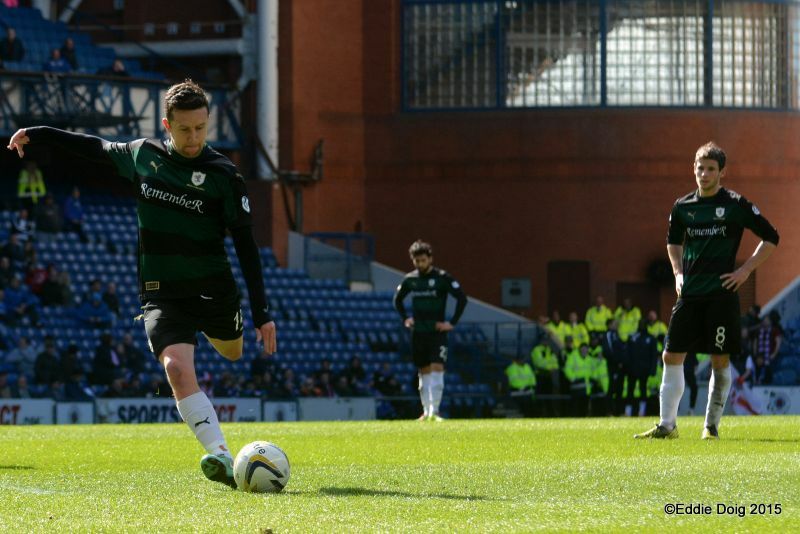 If Rovers were to avoid a similar outcome from that day, they were going to have to press the play further up the park, a tactic they used so successfully in the Scottish Cup victory back in February. 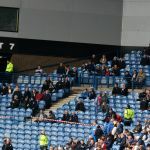 However, even though Rangers were playing at a fairly pedestrian pace, with passes going from side-to-side and backwards, much to the home fans dismay, the Raith players were hemmed into their own half. Mark Stewart seemed isolated up-front, and whilst Lewis Vaughan was trying his best to supplement him, there were few others getting forward to assist, meaning out balls from the back were minimal. 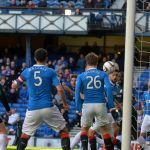 Despite having the majority of the ball, Rangers were struggling to create anything of note from open play, with a Law shot which was easily gathered by Cuthbert, their only other discernible attempt at goal in the opening quarter-of-an-hour. It took Rovers slightly longer than that to create their first attacking move, with Conroy and Vaughan involved in a neat interchange, before bringing Rory McKeown into the game after he had advanced down the left, but his cross into the box was easily dealt with. 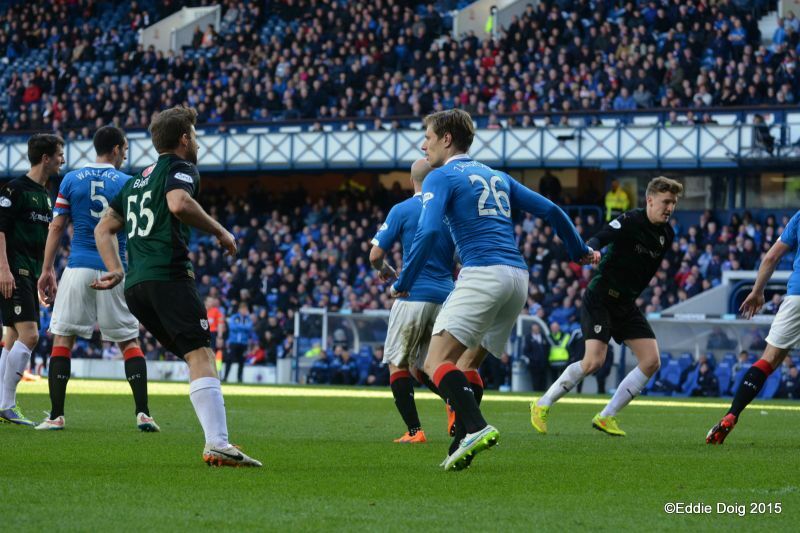 From the breakdown of that sequence, Rangers went straight up the park, in a move which ended with Dean Shiels seeing his effort deflected into Cuthbert’s arms. 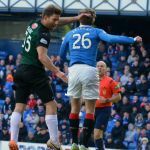 With the momentum of the match all with Rangers at this point, it was no great surprise to see them go two goals up with a little under 30 minutes played. 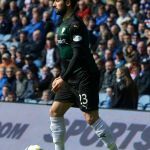 Right-back, Robbie Crawford fed the ball forward to Haris Vuckic on the right touchline, and in a move that was very similar to the goal he scored recently against Hearts, he cut inside to a pocket of space, before firing a crisp finish past Cuthbert into the bottom right corner of the net. At that point, you feared the worst from a Rovers point of view, but it was the away side who created the next opportunity. Vaughan wriggled skilfully away from two men before being impeded on the edge of the area. However, Ryan Conroy couldn’t replicate the precision of his successful free-kick at the same venue two months ago, and while his attempt was on target, Cammy Bell was able to palm it away to safety. The half ended with two more chances for the home side. Firstly, Clark almost grabbed his second when he guided a Law cross-come-shot just past the post, then Marius Zaliukas headed a corner over the bar, as Rovers clung on to a two goal deficit at the interval. Something was going to have to change in the second period if Rovers were to get anything from the match, and it did, with a slight adjustment to the system, with Martin Scott moving closer to the front two. 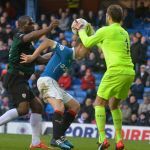 There also seemed a far bigger emphasis on shutting the Rangers players down quicker, and further up the park, and for the first time in the match, Raith were in the ascendency. Martin Scott forced a corner in the opening few moments, and the cross found Conroy on the edge of the box, but his attempt was well over. Jason Thomson then dashed forward, and like Wallace’s close call in the first half, his cross seemed to get caught in the wind, meaning Bell had to take evasive action to prevent it dropping in. 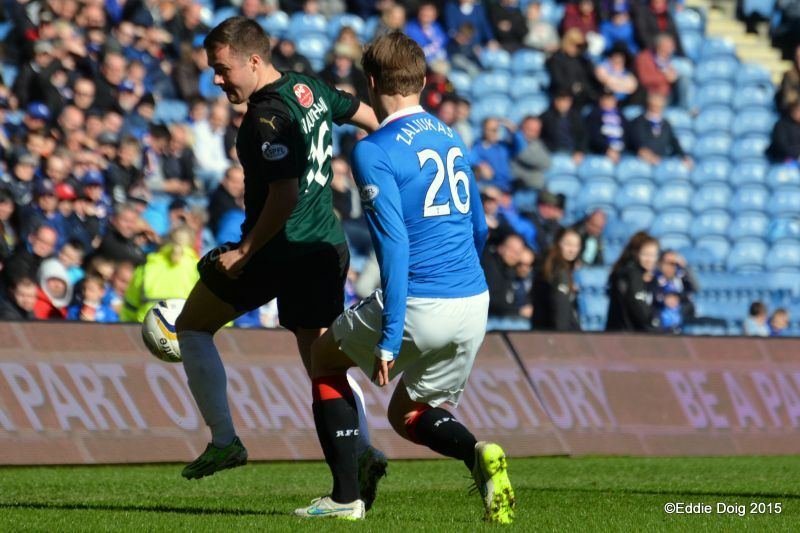 A fair portion of the game was now taking place in Rangers territory, but if Rovers were going to take advantage of it, they were going to have to take one of the half chances that were coming their way, however, they spurned a great opportunity in the 56th minute. Grant Anderson’s initial cross was blocked, but after regaining the ball, his attempt at a shot was scuffed to the edge of the box to Conroy. With time to look up, his curling effort was pulled wide of the target, when he perhaps should have done better. 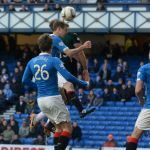 A few moments later, Rangers missed their own gilt-edged chance, when the impressive Robbie Crawford played a low cross to the back post, but Law’s late run, and the firmness of the cross meant he failed to get a good connection on it, as he sliced it over the bar. With twenty minutes remaining and Raith still looking capable of taking something from the match if they could grab a quick riposte, Grant Murray made a double substitution, replacing Vaughan and Stewart with Christian Nadé and Calum Elliott. 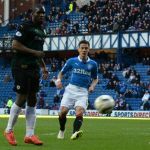 However, within moments, the game was effectively over, as Rangers opened up a three goal advantage with a scrappy goal. 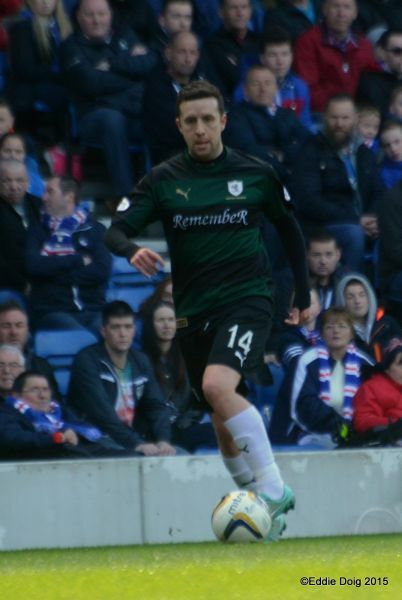 Substitute, Tom Walsh got to the bye-line on the left, and aimed a cross to Law, whose shot crashed off the bar and down, as the Raith defence attempted to clear their lines, Clark was able to steer the ball back to Clark, who had an abundance of time to stroke the ball past Cuthbert from close range. 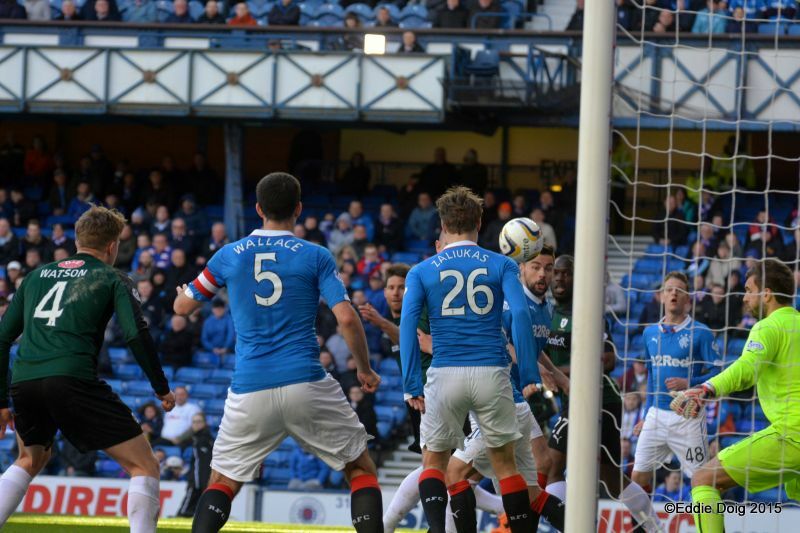 The Rangers players sensed there were more goals to be had in the closing stages, and Cuthbert had a busy few moments, firstly saving comfortably from substitute Kris Boyd, before two excellent stops, the first, a low palm round the post from a Law drive that was heading in, and the second, an impressive tip over the bar from a Walsh header. 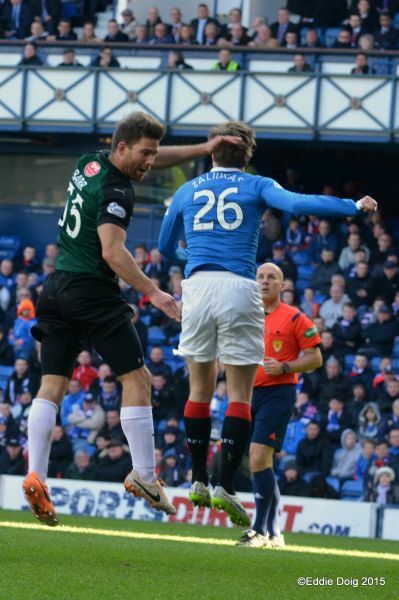 The respite was just temporary however, and Rangers made it 4-0 with two minutes remaining. Boyd picked up possession in the middle of the park and fed it wide to Law, who dribbled in from an angle to curl the ball past Cuthbert and complete the scoring. Raith’s next match is away to the Championship champions, Heart of Midlothian at Tynecastle on Saturday. Welcome to sunny Ibrox, it's no quite 'taps aff' weather, but a fresh 10 degrees. Callachan and Fox are suspended for todays game. It's gone cloudy and breeze is blowing towards the Copeland Road end. 3-5-2 formation with Moon and Scott in the center mid pocket. Moon turned Vuckic inside out as he is dispossessed. Nicky Law with a corner, the ball is headed home at the near post by Clark. 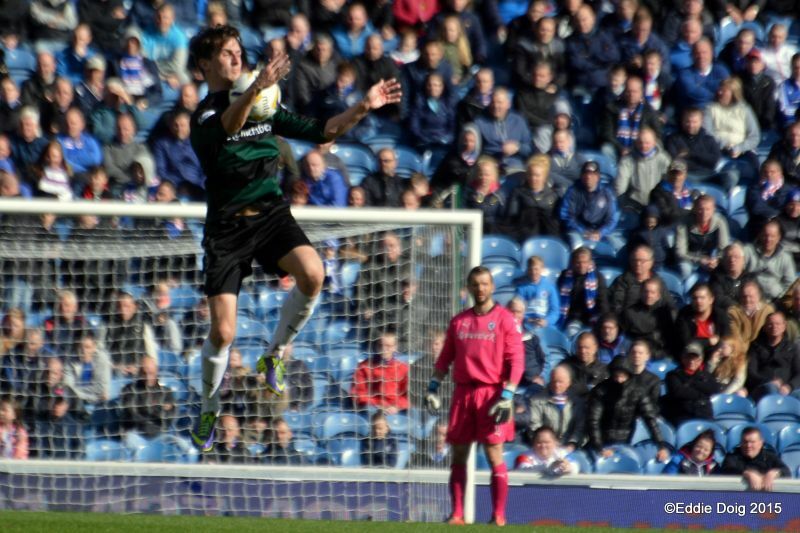 Goal Rangers. 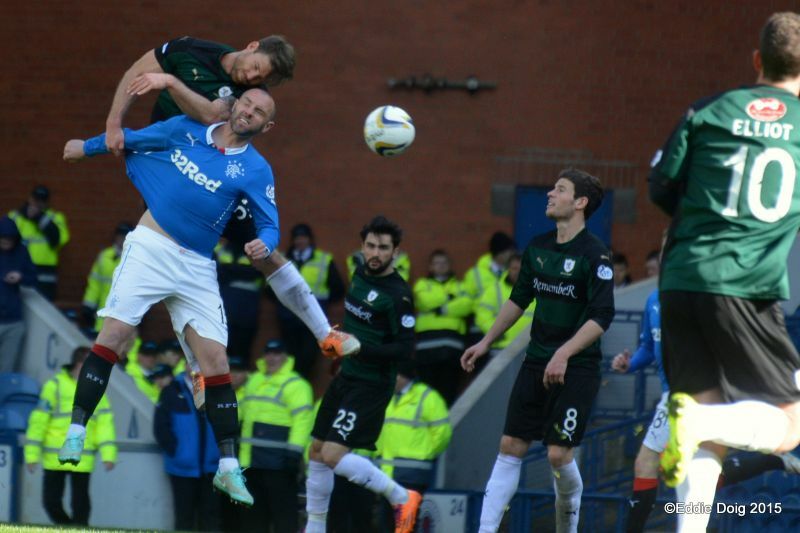 Rangers holding Rovers in their own half. Shiels doing the spade work in midfield released Miller whose shot come cross is plucked out of the air by Cuthbert. A good move engineered by Shiels sees the cross goal pass run out of play past the in rushing Law. The busy Shiels has a go from the edge of the area but his tame shot is mopped up by Cuthbert. 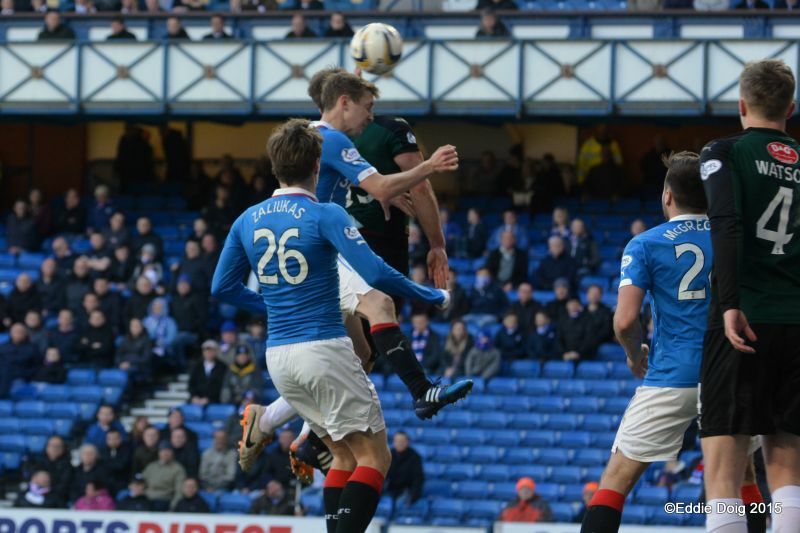 Zaliukas squandered a chance, his header from a corner goes wide. Rovers struggling to get out of their own half. Clark and Vuckic combined but is thwarted by Thomson. 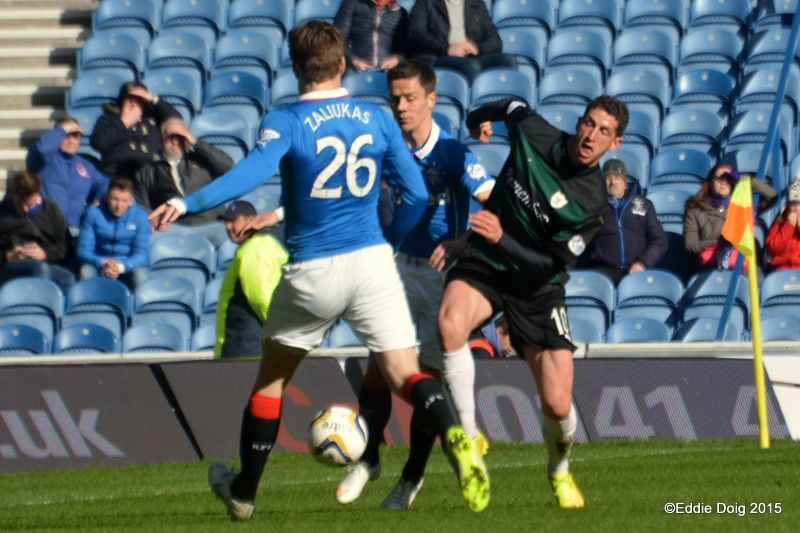 Quarter of the game over and Rovers have had 5 forays into Rangers half. Rovers first corner, Conroy crosses and Vaughan nearly scores with an overhead kick. 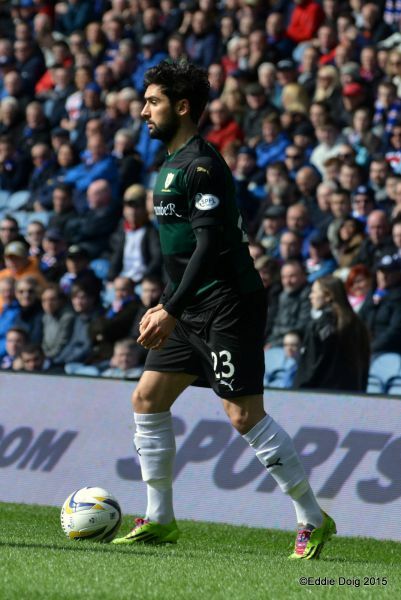 Vuckic saunters past his marker and on his left foot hits a diagonal ball past Cuthbert from the edge of the area. Goal Rangers. 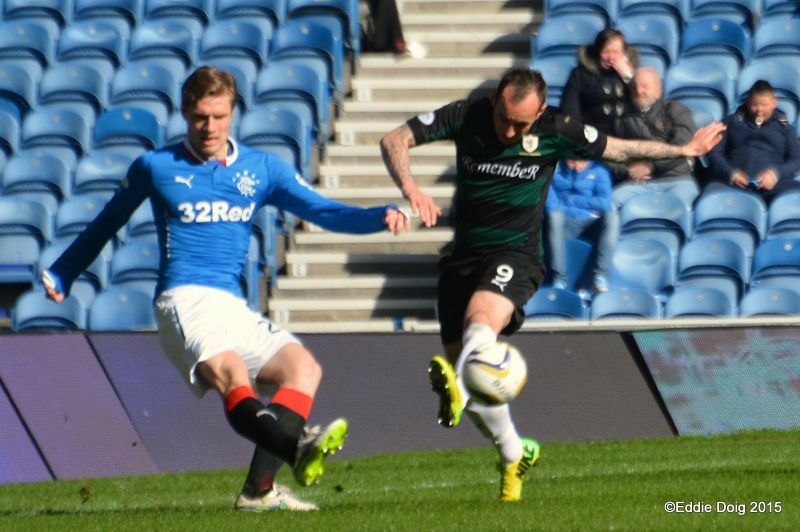 Kenny Miller sends Wallace through but there is too much pace on the ball and Cuthbert clears. Anderson thunders down the right but his cross is no where near Stewart nor Vaughan. Jimmy Scott out guns Miller in the box, shouts for a penalty is waved on by Mr Finnie. Conroy forcing a double handed save from Bell with his free kick at the edge of the area. 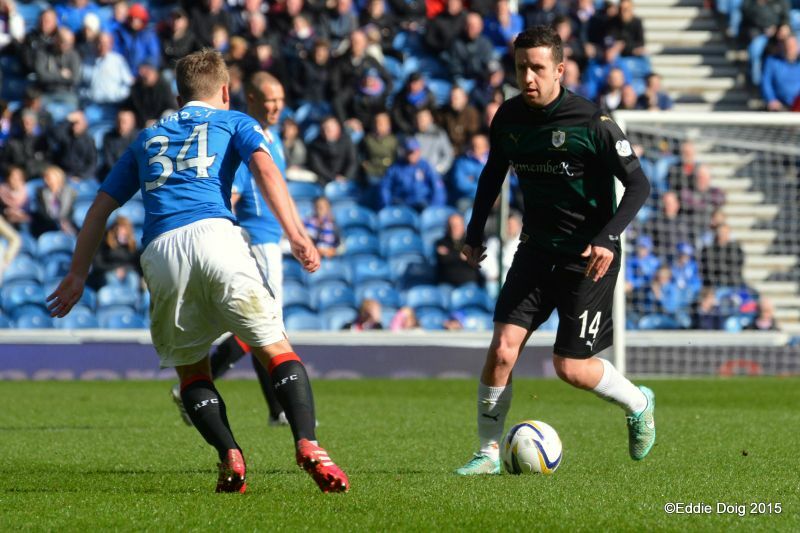 Nicky Clark running onto a loose ball forcing Cuthbert to come out and clear. Law's corner is cleared by Anderson to Murdoch whos tried a shot from 35 which he sliced wide of target. Murdoch rocket hitsan unsuspecting Thomson and goes for a corner, from said corner, Zaliukas heads the ball onto the roof of the net. Vaughan and Stewart kick off the second half. There are no half time substitutes. Crawford curls in a cross hopeful that Clark will connect however Cuthbert clears. Conroy shoots just over from the edge of the box. Thomson crosses and forced Bell to stretch to clear the ball behind for a corner. From a Moon free kick an old fashioned stramash ensued in the box ending with Conroy shooting wide. The home fans getting restless as Rovers have a spell of possession in the away half. Vuckic and Wallace take turns at wondering who would shoot, the latter eventually does and fires wide. Scott spurns a chance from 12 yards, hitting the ball wide. Crawford fires across goal where Miller then Law fail to make contact and the ball rolls out. Stewart and Vaughan off, Elliot and Nade on. Law with two bites of the cherry, his first shot coming off the underside of the bar but made no mistake with the rebound. Goal Rangers. Murdoch has a pop from 25 yards which fell comfortably to Cuthbert. A rare mistake by Barr lets Vuckic through his shot is safely gathered by Cuthbert. Nade comes nose to nose with Bell as they both go up for the ball. Law's squiggler is tipped past the post by Cuthbert, the resultant corner sees Walsh' s shot cleared by the keeper. 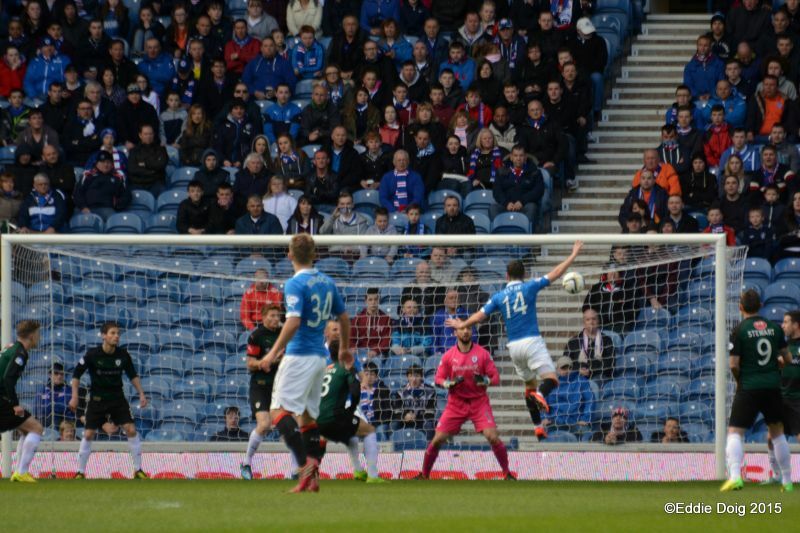 Conroy converts a 40 yard free kick into the lower tier of the Broomloan. The ball is cleared up the park where Law picked his spot. Goal Rangers. Bell, Wallace, Law, Vuckic, Clark, Miller, Crawford, Shiels, McGregor, Zaliukas, Murdoch. Subs, Robinson, Mohsni, Black, Boyd, Walsh, Sinnamon, Hardie. Cuthbert, Thomson, Watson, Anderson, Moon, Stewart, Scott, Conroy, Vaughan, McKeowan, Barr. Subs, McGurn, Hill, Elliot, Nade, Robertson, Matthews, Ford. 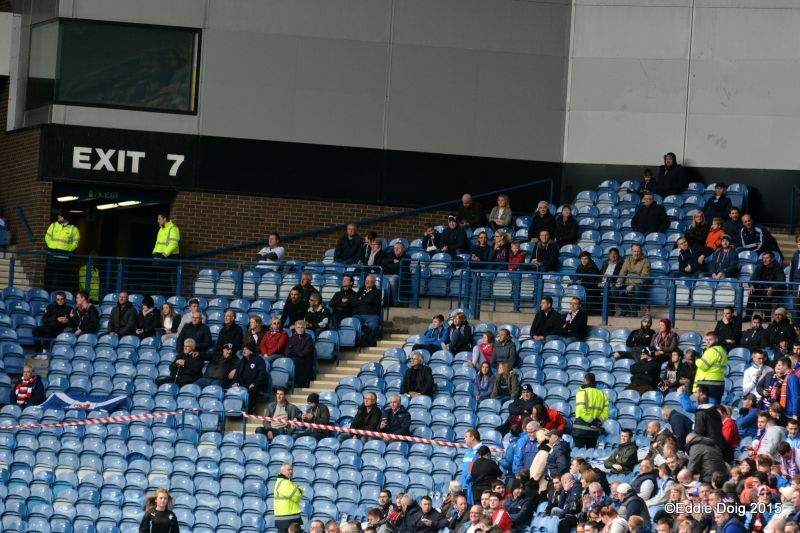 Raith Rovers head to Ibrox on Sunday afternoon, looking for their first league victory at the stadium since 1959. 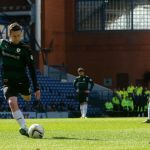 However, they also go there looking for their second consecutive win over Rangers at the venue, after their 2-1 win Scottish Cup triumph in Govan in February. Both teams go into the match on the back of poor results in midweek. Raith lost at home to Cowdenbeath 3-1, after a hat-trick from Colin Nish sealed a vital three points for the Blue Brazil, while Mark Stewart grabbed a late consolation for Rovers. 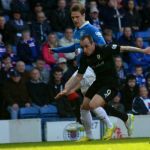 Rangers on the other hand went down 3-0 to Queen of the South at Palmerston Park on Thursday, when goals from Derek Lyle, a Lee Wallace own-goal, and Gavin Reilly, condemned Rangers to their heaviest ever defeat against the Doonhamers. Both results had huge repercussions at both ends of the Championship table. Cowdenbeath now reside in eighth place, five points clear of Alloa Athletic and eight clear of bottom club Livingston, although both clubs have played fewer games than Jimmy Nicholl’s side. 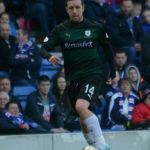 In the promotion play-off spots, Hibernian are now above Rangers on goal difference in second place, while Queen of the South now sit above Falkirk in fourth, despite playing a game fewer than the Bairns. 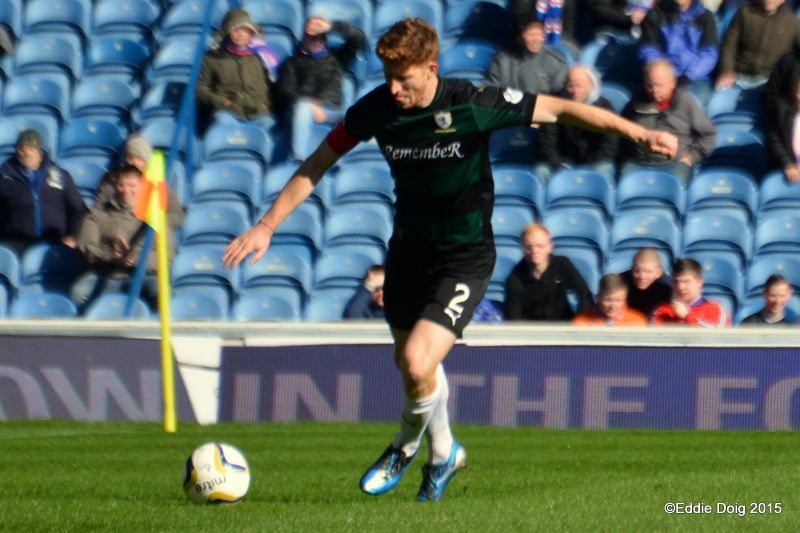 Perhaps crucially however, Queen of the South face Falkirk this weekend. As you would expect, Raith face a tough ask this Sunday, against a side that have taken nine points from nine against Rovers this season. 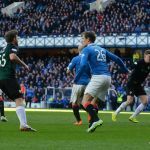 Rangers comfortably won the first two league fixtures, although their last encounter at Stark’s Park was a tighter affair. Andy Murdoch and Kris Boyd put Rangers 2-0 ahead, and although a Ryan Conroy goal with 20 minutes remaining reduced the arrears, Rangers saw the remainder of the game out. 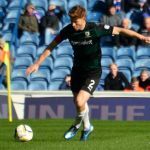 That result was Rangers fifth straight league win over the Kirkcaldy club, and in the most recent league meetings, Stuart McCall’s side have won eight and drawn two of the last ten encounters. 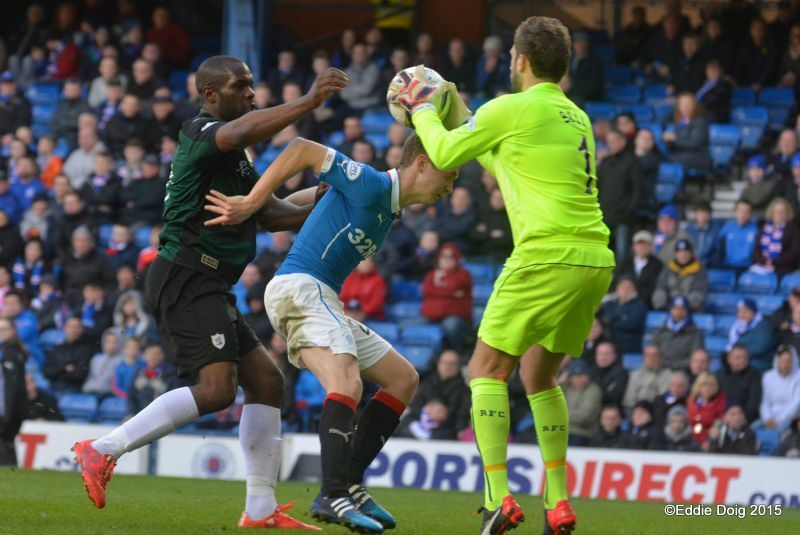 Sunday afternoon’s referee will be Stephen Finnie.